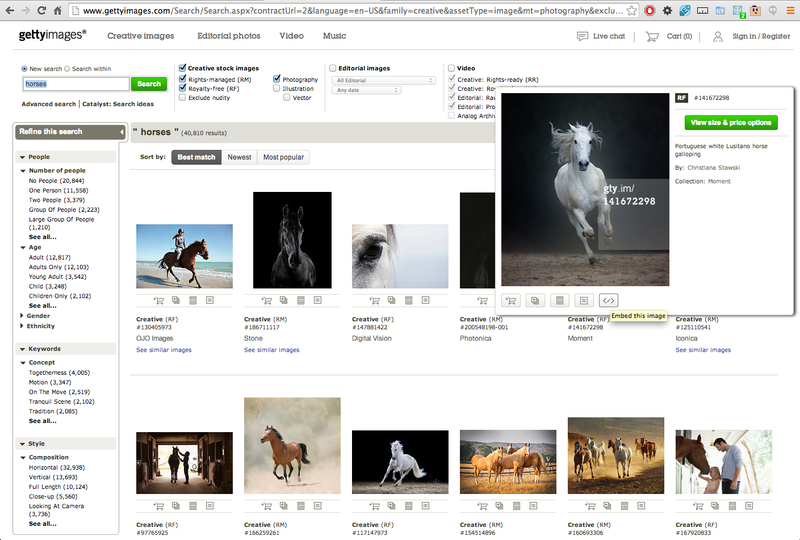 Recently, the big news was that Getty Images–a huge stock photo company that has been around for many many years, and got really big doing print design photography–recently came out and gave permission (with certain strings attached) to use their vast library of images on blogs and non-commercial web use. This was pretty huge. The reason for it, apparently, was that there was so much rights infringement on the web already that they really couldn’t stop it–but instead, they played along with it, in that, yes, you can post their pictures in your blog, and that the embed code given for such a purpose would link back to their site, enticing potential buyers to see the products for commercial and print use, so in essence, it becomes free advertising. So, with that in mind, you can certainly draw from their immense library of images, but only use small images (such as these) and you will not be able to edit them in any way–they are but mirrors to images hosted on their site.